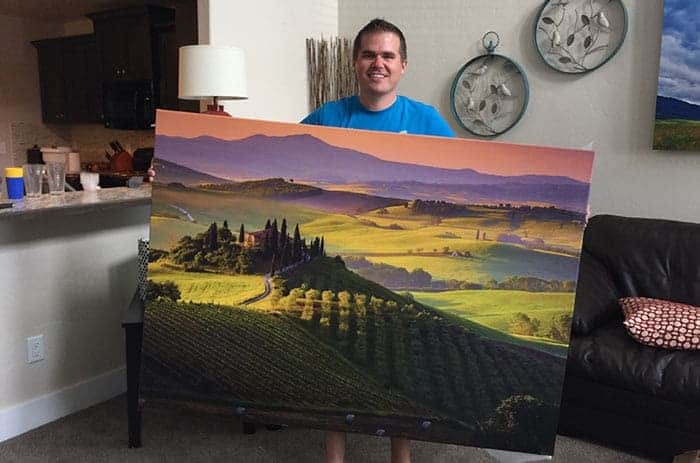 Yesterday, I received in the mail a huge canvas gallery wrap of a photo I took a few weeks ago in Tuscany. It was an expensive print ($200), so I wanted to be sure I was using the very best pen or marker on the print to put my signature on it. Trouble was, I wasn't sure which to pick, so I went to the store and bought over a dozen pens and markers to test. Ultra-fine point (top) vs fine point (bottom). I personally prefer ultra-fine but some people like the fatter fine point. Go buy this marker on Amazon.com right now. Seriously, the rest of this post isn't even worth your time. Just trust me–that's the marker you want for signing photographic prints of any kind on any medium (canvas, paper, metal, acrylic–you name it!). Buy the silver one linked to above for most prints (most photos have darker edges, which is where you sign). For prints with lighter colors, get this black version of the same pen. Most photographers will prefer the ultra fine point of the two above listed pens, but if you're signing an extremely large print or just prefer the fatter writing of a fine point, then this is the one to get. I had never signed this glass print because I couldn't find a marker that I knew for sure wouldn't smudge. But the Uchida was perfect! The Uchida DecoColor liquid paint pen was–by far–my favorite pen in the test for signing all kinds of prints. 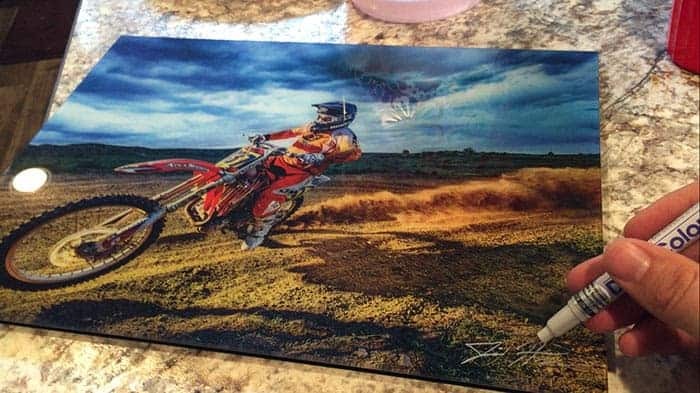 It works on canvas, photo paper prints (even glossy! ), glass prints, metal prints, and just about anything else you throw at it. Most of the pens in the test didn't stand a chance on glossy surfaces. Aside from that, this marker is one of few that explicitly states that it uses only acid-free ink, which is essential for preserving your heirloom artwork. The Uchida uses a glossy, oil-based paint, so you have to shake the pen before use and it has a metal ball inside it that mixes the paint (very similar to how spray paint cans). 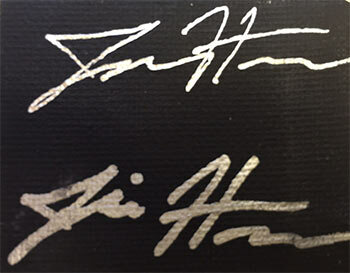 The silver color (most popular for signing photos) really stands out nicely on a dark or medium background, but the pen also comes in black if you'll be signing a light-colored print. I bought 13 markers and pens to use in testing. Each of the pens went through 5 different tests and was subjected in a blind test to a “jury” of three people. (Yes, that's a ridiculous amount of effort for marker testing. No, I'm not ashamed of how in love I am with anything even remotely related to photography). The pens were tested according to quality of the ink, smudge test after 30 seconds, smudge test after 10 minutes of drying, torture test (soaked in water and then scrubbed hard), as well as looking at things like whether or not it has acid-free ink. The results of the “torture test” to simulate how the markers withstand intense smudging, moisture, and heat. Lesson learned? ONLY SIGN PHOTOGRAPHY WITH LIQUID PAINT PENS! DO NOT USE MARKERS! I wanted to give the pens and markers the ultimate test to really push them to the limits. After giving all of the pens an hour to dry, I put them in soapy hot water and then cold water for about 5 minutes. Then I took them out in the hot sun and scrubbed the heck out of them with my finger. I had expected before the test that I would prefer the fine point markers, but after the “prettiest signature” test, but two out of the three judges had a strong preference for the ultra fine point. Here, the liquid paint pens really shined. While all of the markers smudged to some extent, the liquid paint pens dried very quickly and withstood both the 60 second and 10 minute smudge tests the best. We did two types of smudge tests because some inks dry quickly but can smudge later, and others are very durable but only once left to thoroughly dry.